Exceptions to indefeasibility Indefeasibility of title which means that the ownerâ€™s title or interest in the land become not able to be defeated or doubted by any unfavorable claim which are not stated in the register. The case of Teh Bee v K .Maruthamuthu held that if there is no any of the vitiating factors stipulated in section 340 of the National Land Code (NLC) 1965, once the title is registered, it is indefeasible. For example, when Hanif bought a piece of land and then went to Land Office for the purpose of registered the title under his name as to be a legal owner of the land. Once the registration process is made, then Hanifâ€™s title of land becomes unchallengeable and indefeasible. 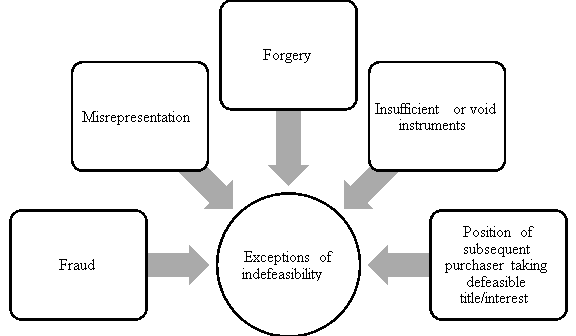 However, Indefeasibility is not absolute. There are certain circumstances where the registered title or interest may be invalid or defeated which are stated in section 340(2) under NLC and also by case law. The title of land is can be defeated where there is fraud, misrepresentation, forgery, if the title or interest was unlawfully obtained. Where the title of land is registered, then the title is indefeasible but under section 340(2) NLC which is obtained the title by way of fraud, so the title can be defeasible. The law is settled that while section 340 makes it very clear that the title or interest of a register owner shall be indefeasible. In the case of actual fraud under section 340(2), such title or interest shall not be indefeasible. The question of existence of fraud is one of fact to be determined in the facts surrounding each particular case. When the person who is claim that they are fraud, then the duty of the person is to find evidences to proof that the fraud is truths. For example, Pai Lang is forges Ho Langâ€™s signature to transfer the land to him. After Ho Lang discover that his land are being transferred to Pai Lang by the way of forgery, then the Ho Lang must find evidence to proof that Pai Lang is through the way of forgery to transfer his land without knowledge. In addition, the case of Public finance Bhd v Narayanasamy  is also one of the cases that is does not enjoy the indefeasibility provided under section 340 NLC 1965. The court held that the appellantâ€™s insists that the third parties do not have any rights, apart from the right to damages against the respondent for break oneâ€™s promise; this is so clearly unreasonable that the learned judge is reasonable in holding that they are guilty of fraud and conspiracy. If they admit that the sub-purchasers have the right to the lands they had paid for, it will be impossible for any court to say that they want to perpetrate a fraud. For example, when the chargee is involved in the guilty of fraud and conspiracy, then the chargeeâ€™s application for order of sale of charged land would be defeated. This means that the chargee does not enjoy defeasibility of title as the chargee is obtained the title of land by the way of illegal action. Lee and Detta (2009, p.732) acknowledge that section 340(3) provided that nothing in this subsection shall affect any title or interest acquired by any purchaser in good faith and for valuable consideration, or by any person or body claiming through or under such a purchaser. The result of section 340(3) is that where a registered title is presented defeasible by the grounds of the circumstances provided under section 340(2) NCL 1965, it is liable to be void not only in the hands of the immediate registered owner but also any subsequent purchaser.